Workplace giving (also known as Payroll Giving) is a joint relationship between employers, employees and charities. 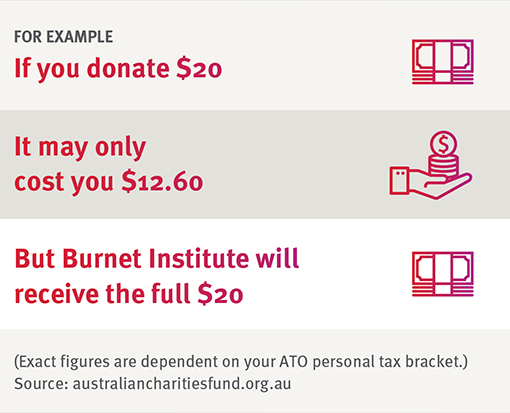 You can contribute a portion of your pre-tax salary to Burnet Institute and receive the tax benefit straight away rather than waiting until the end of the financial year. In many cases employers will match workplace giving donations, making your gifts go even further. Sign up today and make your giving go further. What steps do you take to sign up for Workplace Giving? STEP ONE: Ask your employer if they have a Workplace Giving Program? If not, you may ask them to enter into a Workplace Giving Program. STEP TWO: Fill in the Burnet Institute Workplace Giving form, where you can nominate Burnet Institute as your preferred charity. Give a copy to your Payroll Office and send a copy to Burnet. STEP THREE: Help Burnet achieve better health for vulnerable communities in Australia and internationally by accelerating the translation of research, discovery and evidence into sustainable health solutions. Download our Workplace Giving form. Julie Wood will be happy to assist you in getting started. Her contact details are on the right side panel. Make your giving go further with workplace giving. Contribute to Burnet and receive tax benefits straight away.